When you are not in the area: regular checks of the moorings and mooring lines, shore connections and batteries. Ventilating after rain and checking the bilges. Periodical checks of engines and batteries, capstan and chain, life saving and fire fighting equipment, etc. 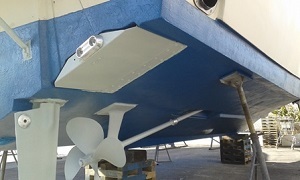 Advise and price quoting regarding repairs, maintenance, dry docking, antifouling, anodes, etc. For major repairs there is a cooperation with Nautica Mike, for many years a reliable expert at the Costa Blanca in the field of boats and engines.